Utban, a wiry man of 36 years, belongs to a nomadic people known as the Afar, who spend their lives wandering through the eponymously named state in northeastern Ethiopia. "This is the worst time I've experienced in my life," he says. On some days, he doesn't know how to provide for himself and his seven-member family. 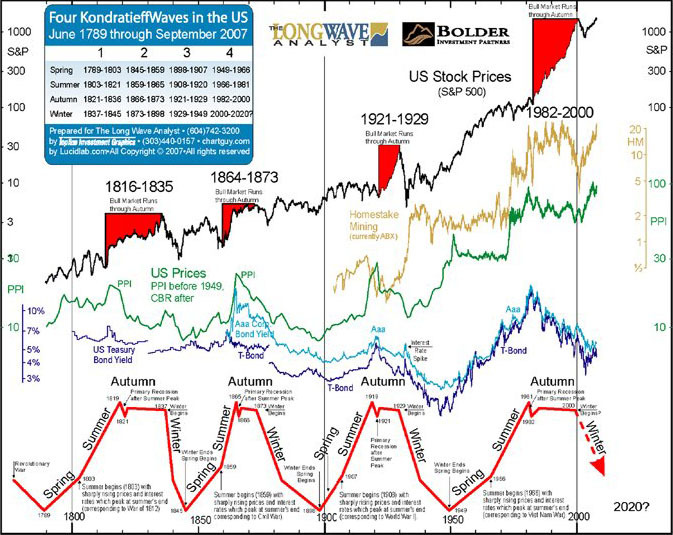 Finally looking at long term economic cycles we are entering a traditionally weak period for risk assets which tend to make lows every 8 years or so marked by economic troughs. We recently had major economic downswings in 1992, 2000 and 2008 and are due one in 2016. In conclusion several hall marks of a recession such as collapsing commodities, stock markets and collapsing currencies have already started to play out as we enter 2016 and deflationary forces seem to be taking control. Flight to quality in safe haven assets such as the Dollar and Yen suggest risk appetite is rapidly declining. The massive fall in shipping activity is also providing evidence that a massive slow down is at hand. Excessive speculation as evidenced by the risk exposures of prominent global financial institutions is also a major concern. Additionally the velocity of money has collapsed suggesting that the circulation of money through the economy is simply not occurring despite record low interest rates. Last but not least long term economic cycles also are suggesting that the upcoming recession could last at least till 2020 and the final effects of this major down cycle are yet to be felt. SOMETIMES the financial markets seem to go in a different direction from the fundamentals. Global economic forecasts for 2016 are still being revised downwards and the rate of defaults on corporate bonds is rising sharply. But since the middle of February, share prices have rallied strongly while the spread (the excess interest rate over government bonds) paid by corporate borrowers has fallen significantly. The reason for this divergence is that investors are affected not just by news, but by how the news diverges from their expectations. Things may not be great, but they are not as bad as was feared earlier in the year. In February there were widespread worries about the Chinese economy—concerns that the plunging price of oil and other commodities seemed to validate. The latest data suggest the Chinese economy is slowing but not crashing; commodity prices have rebounded. In February the Federal Reserve was also expected to tighten interest rates repeatedly this year; now investors think it will move cautiously. The mood of the markets has changed in other ways too. Rob Arnott at Research Affiliates, an advisory firm, says conditions at the start of 2016 resembled those that pertained in early 1999. Inflation expectations had been falling, emerging equities and currencies were underperforming and “growth stocks” (in technology, for example) were beating “value stocks”—those that look cheap relative to their peers. All these trends have since reversed. The rebound in commodities has helped sentiment towards emerging markets and pushed up inflation expectations (crucially, investors seem less concerned about deflation). Tech stocks have mostly headed south amid disappointing profits from Alphabet, Apple, Microsoft and Twitter. The markets’ mood swings may reflect the difficulty in analysing the global economy since the financial crisis of 2008. It has neither recovered as strongly as many expected nor slipped back into recession. In addition, investors face a continuing dilemma. Low (and sometimes negative) yields on cash and government bonds mean that the stockmarket looks like the only plausible source of decent returns. But many wonder whether the bull run in equities, which began in 2009, can be maintained in the face of a sluggish economic recovery and faltering corporate profits. Whenever the economic outlook darkens, investors sell equities. But the sell-offs don’t last long given the paltry returns available elsewhere. Short-term volatility is not the biggest problem facing pension funds, endowments and insurance companies. A new report from McKinsey, a management consultancy, argues that future investment returns are likely to be lower than the exceptional figures achieved over the past 30 years (see chart). A lot went right for investors over that period, after all. Inflation declined, allowing bond yields to fall and equity valuations to rise, delivering outsize capital gains; global GDP growth was boosted by the emergence of China and by productivity gains from the internet; corporate profits around the world rose, from 7.6% of global GDP in 1980 to 10% by 2013, by McKinsey’s reckoning. These trends are unlikely to continue. Bond yields are very low and can hardly fall much further; equity valuations are already high; GDP and productivity growth have disappointed recently; profit margins are high and seem more likely to fall than rise (the slowdown in tech profits reinforces that impression). 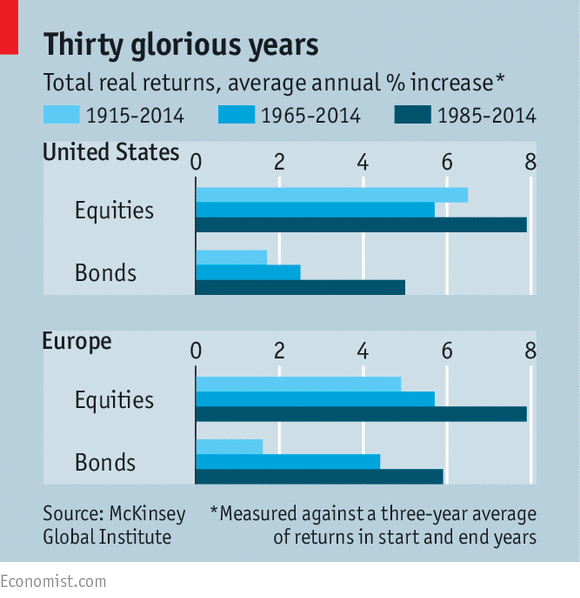 McKinsey reckons that, in a slow-growth environment, real annual returns from equities over the next 20 years may be 4-5%, well below the average of the past 30 years; real bond returns may be just 0-1%. Even a rebound in American growth to 2.8% a year might generate real equity returns of only 5.5-6.5%, below the average of the past three decades. Central banks, by offering support to asset markets in the form of quantitative easing, may have pushed up valuations (and pushed down yields) in the short term. But in essence this means that the markets have “borrowed” returns from the future; from a starting point of higher valuations (lower yields), future returns are likely to be lower. This has big implications for today’s workers. McKinsey reckons that a 30-year-old will have to work seven years longer or save almost twice as much to afford the same pension as the typical baby-boomer. But with job security weak and wage growth hard to come by, few 30-year-olds will have enough income to ramp up their savings. The eurozone has provided investors with plenty of surprises in the past few years, most of them unpleasant. The economic data released Friday make for a refreshing change. 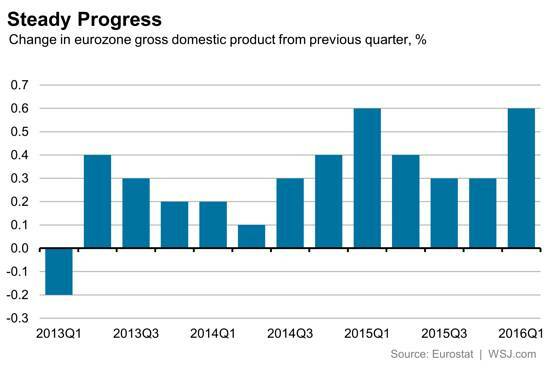 Eurozone growth in the first quarter versus the fourth came in at 0.6%, or 2.2% annualized. That was better than economists expected. It was also better than first-quarter growth in the U.S. and U.K., although the eurozone remains a laggard overall, with real gross domestic product only just above its precrisis peak. Meanwhile, unemployment continued to fall, reaching 10.2% in March, down 1 percentage point from a year ago. The only fly in the ointment was inflation, which dipped back into negative territory at an estimated minus 0.2% in April. There is a caveat on growth: this is the first time Eurostat has released such an early estimate of first-quarter GDP, and as such it may be revised. Details are still missing, with no growth estimates publicly available for Germany and Italy in particular, which together account for 45% of the eurozone economy. However, the headline number does suggest decent performance. France and Spain posted strong numbers, with the former recording the biggest jump in household spending since the end of 2004. Domestic demand looks to be driving the recovery. 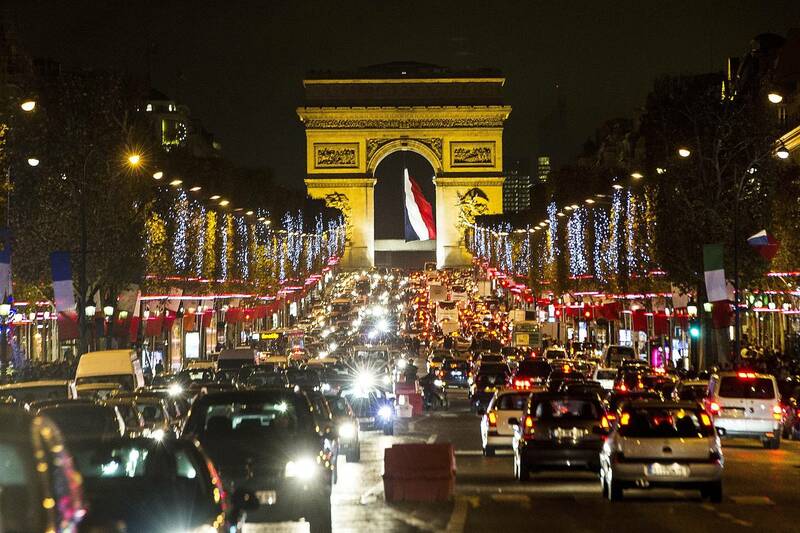 The performance of the economy is in contrast to the nerves that infected European markets in the first quarter. The end of March saw the Stoxx Europe 600 down some 7.7% for the year, and 10-year German yields nearly half a percentage point lower than at the end of 2015. There was even a panic about eurozone banks, with violent swings in prices for subordinated bonds that count toward capital—although this was a crisis more about investors’ assumptions than the banks themselves. True, growth may not be sustainable at the first quarter’s pace, as it appears to be well above trend. The European Commission, for instance, thinks potential annual growth is just 1% in 2016-2017. Even so, there could be upgrades of the eurozone’s prospects rather than downgrades: BNP Paribas, BNPQY -2.64 % for instance, notes there are “upside risks” to its 1.3% full-year forecast. The upshot should be a period of calm in monetary policy, too. The European Central Bank unveiled new measures in March and accompanied them with a plea to allow time for them to take effect. Friday’s data suggest that is the right approach to take. The eurozone, for now at least, is bucking the global gloom on growth. Rousseau was perhaps the first to popularize the fiction now taught in civics classes about how government was created. It holds that men sat down together and rationally thought out the concept of government as a solution to problems that confronted them. The government of the United States was, however, the first to be formed in any way remotely like Rousseau's ideal. Even then, it had far from universal support from the three million colonials whom it claimed to represent. The U.S. government, after all, grew out of an illegal conspiracy to overthrow and replace the existing government. The origin of government itself, however, was nothing like Rousseau's fable or the origin of the United States Constitution. The most realistic scenario for the origin of government is a roving group of bandits deciding that life would be easier if they settled down in a particular locale, and simply taxing the residents for a fixed percentage (rather like "protection money") instead of periodically sweeping through and carrying off all they could get away with. It's no accident that the ruling classes everywhere have martial backgrounds. Royalty are really nothing more than successful marauders who have buried the origins of their wealth in romance. "A castle was not so much a plush palace as the headquarters for a concentration camp. These camps, called feudal kingdoms, were established by conquering barbarians who'd enslaved the local people. When you see one, ask to see not just the stately halls and bedrooms, but the dungeons and torture chambers. "A castle was a hangout for silk-clad gangsters who were stealing from helpless workers. The king was the 'lord' who had control of the blackjack; he claimed a special 'divine right' to use force on the innocent. "Fantasies about handsome princes and beautiful princesses are dangerous; they whitewash the truth. They give children the impression political power is wonderful stuff." The violent and corrupt nature of government is widely acknowledged by almost everyone. That's been true since time immemorial, as have political satire and grousing about politicians. Yet almost everyone turns a blind eye; most not only put up with it, but actively support the charade. That's because, although many may believe government to be an evil, they believe it is a necessary evil (the larger question of whether anything that is evil is necessary, or whether anything that is necessary can be evil, is worth discussing, but this isn’t the forum). Muslims, Christians, and Jews lived together peaceably in Palestine, Lebanon, and North Africa for centuries until the situation became politicized after World War I. Until then, an individual's background and beliefs were just personal attributes, not a casus belli. Government was at its most benign, an ineffectual nuisance that concerned itself mostly with extorting taxes. People were busy with that most harmless of activities: making money. But politics do not deal with people as individuals. It scoops them up into parties and nations. And some group inevitably winds up using the power of the state (however "innocently" or "justly" at first) to impose its values and wishes on others with predictably destructive results. What would otherwise be an interesting kaleidoscope of humanity then sorts itself out according to the lowest common denominator peculiar to the time and place. Throughout history government has served as a vehicle for the organization of hatred and oppression, benefitting no one except those who are ambitious and ruthless enough to gain control of it. That's not to say government hasn't, then and now, performed useful functions. But the useful things it does could and would be done far better by the market.